The rebuild of St Mary of the Angels Church may never have happened. The revelation was made by Parish Priest, Barry Scannell SM in the lead up to the world premier of a documentary about the church’s rebuild. Describing the eventual outcome of the seismic strengthening as “stunning”, Barry Scannell told Stuff they never really knew if it would work out. Grateful to all those involved, he called the whole project a “great test of faith”. The story of the seismic strengthening of St Mary of the Angels church had its world premiere at the Embassy Theatre in Wellington on Thursday 8 December. The feature-length movie, “A Test of Faith”, tells the story of how the Wellington city icon was taken apart, and how through innovative engineering was replaced with modern materials and made safe. Originally the film was a way to document the church-strengthening project, however filmmakers Paul Davidson and Barbara Gibb quickly realised there was more to the story. Labelling the finished film as “remarkably rich”, Barry Scannell says “the documentary is a story anyone will enjoy”. He says the documentary “beautifully captures” the scale and challenges of the rebuild. Proceeds from the gala, which had a price tag of $100 per ticket, will help fund completion of unfinished work on the church crypt, choir room and grounds. 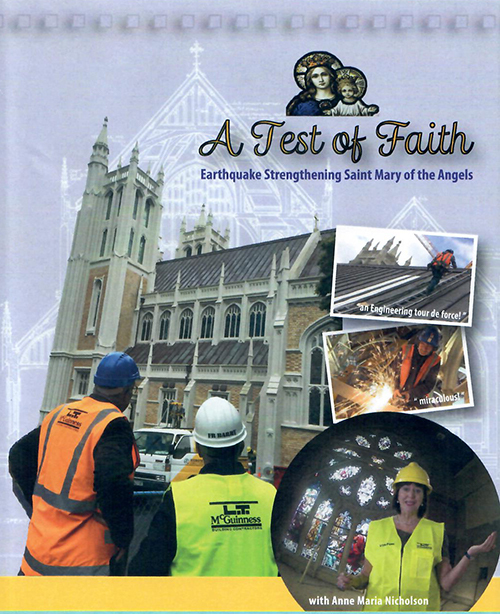 A Test of Faith – St Mary of the Angels from Paul Davidson on Vimeo.